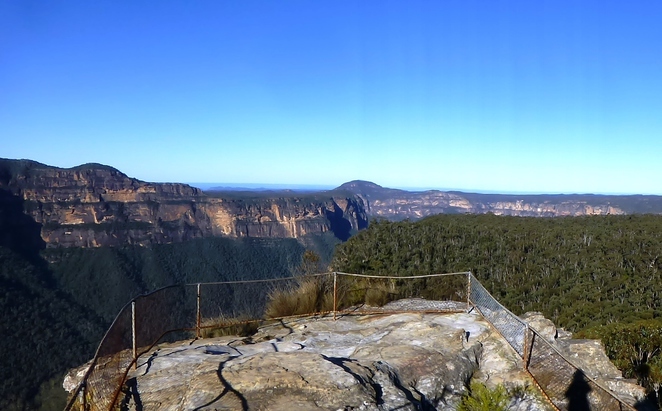 Anvil Rock is an often overlooked attraction of the Blue Mountains. The site is located at the end of Hat Hill Road, Blackheath and offers magnificent views over Grose Valley. Anvil Rock takes little time to access, about a 10 minute walk from the car park. A wooden chair at the base of the rock offers the perfect spot for reading, romance or reflection. Less than half a kilometre away from Anvil Rock is Wind Eroded Cave, an unusual rock formation also worthy of a visit. One potential drawback of Anvil Rock is that a large part of Hat Hill Road is dirt and quite rocky, so care should be taken driving to and from the site.